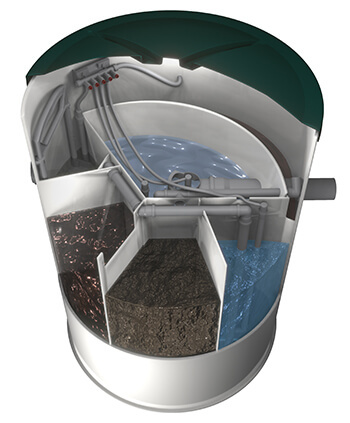 Why is purchasing the AQUATEC VFL wastewater treatment plants beneficial to you? The issues related to choosing treatment plants for customers are known by AQUATEC management. Since a wastewater treatment plant represents a technological facility, the customer whose sewage needs to be drained from his/her house (or other property) is dependent on information from representatives from many companies that are doing business in the Slovak market. Therefore creating the possibility of causing misinformation and disappointment. A wastewater treatment plant sustainability is approximately 20 years. A correctly design wastewater treatment plant operation depends upon the quality of its technology and operation. We are aware of the customer complications and understanding the special terms clearly when communicating with the sales department. Foremost advocating the slogan is vital "Seeing with your eyes is better than hearing it a hundred times." Inviting you to attend the presentation on established wastewater treatment facility on our premises is paramount. We will share your travel costs by discounting the wastewater treatment plant facility after visiting and placing the order with our company. Always a step ahead – our company focuses on perfection and comfort in running and providing services of wastewater treatment plants always keep us a step ahead. The production quality is of the highest standard – requiring all of our workers to be holders of European welders of plastics certificates. Using first-rate materials, machines and tools of very high quality made by world renowned producers. Servicing – if the engineer intervention service is required he is able to arrive within 24 hours. Our servicing department provides our customers with 24 hour phone service in the event of any problems arising. We will be glad to provide you with a professional advice and assistance – The operation of AT 6 wastewater treatment facility allows communication with the professional staff experts and a pleasant environment on our premise over a nice cup of tea or coffee. Direct visual inspections are provides at our customer´s sites. We can have trained workers visit in person whether in home or the construction sites helping the customer ascertain the most suitable place for the wastewater treatment facility. AT6, AT8, AT10, AT12, AT15 and AT20 wastewater treatment plants from Aquatec VFL company. 10 year warranty for a tank shell water-tightness – customers will receive a guaranteed 10 year warranty for a tank shell water-tightness based on its quality. We are honored to provide this warranty. We use renowned suppliers for first-rate material - for supreme quality of polypropylene; brand blowers; water and air distribution devices. 8 mm thickness of tank shell – because of 8 mm thickness we guarantee high statics and stability of the plant compared to other manufacturers using the weaker material around 25 % to 40%. Free of charge storage – purchasing any on-going discounted plants without the possibility of installing it, we will be more than happy to store the plant in our premises until the situation allows you the installation of the plant. Delivery of AT 6 and AT 8 wastewater treatment plants farther than 125 km is free of charge. We will deliver the wastewater treatment facility and provide you with the detailed operation instructions presented by our trained staff. The simplicity of installing the plant – the installing does not require a professional. But one will be available through our company. Lockable cover for the safety of your children –the covers of the wastewater treatment plants are secured with a standard lock allowing your children play joyfully in the garden.